This index, built from government indent records, holds the details of 97,797 convicts who arrived in New South Wales between 1788 and 1842. 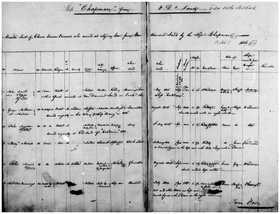 With the index you can discover the name, date of arrival and the ship transported on for each convict. Upon arrival the indent list would be checked against the convicts, before the convicts were handed over to the New South Wales authorities, where most of them remained. A small number were sent elsewhere.